In the Summer League we´ve seen Finish Petteri Koponen playing point guard (last year he played in the Summer League for Portland as well), and this year´s pick, Jerry Bayless, is playing as a guard. 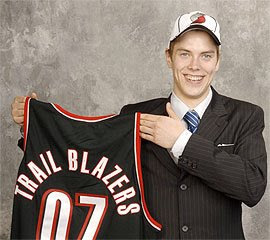 Petteri is playing really well and maybe this year he´ll we be able to make himself room in the Blazer´s roster. Bayless plays point guard and for sure he´s going to be in Portland´s roster. Neither his size nor his play skills will allow him to play guard in the NBA. He´s just a point guard so... another problem for Sergio Rodríguez.